Support American jobs and get this "MADE IN USA" product! Our cargo nets are made from heavy duty nylon netting and are strong enough for military use. The 96x144 size and 4 inch wide box web design is perfect for holding down most anything to your pickups, trucks and trailers. Cinch rope with locking cam allows you to pull the net tight over your cargo items or junk. Includes Spring Clip Carabineers for universal attachment and free Storage bag. Best of all they are Made in USA! Heavy duty military style nylon netting. 96x144 size fits all trucks and larger trailers. 4 inch wide box design. Includes cinch rope with cam lock, carabiners for easy attachment and storage bag. For moving supplies, tying down tools, or hauling camping gear, this general-purpose durable bungee cord cargo net adjusts to secure loads of various sizes and shapes. The 32 high-strength plastic hooks won't rust or damage your truck's finish and can be hooked anywhere on the bed for versatility. When unstretched, this convenient cargo net is 96 inches (243 centimetres) long and 72 inches (183 centimetres) long. The Husky 16 ft. x 1-1/4 inch Ratchet Tie Downs (2-Pack) feature break strength of up to 2300 lb. and include hooks for your convenience. The tie downs have a ratchet-style fastener and a strap length of 16 ft. for versatility. Great for multiple uses. Husky 4 in. hook is the most commonly used hook with your Husky Wall Storage System. Ideal for holding small hand tools, cleaning supplies and other implements, the 4 in. hook is made of heavy duty, high grade steel, welded and powder coated for corrosion resistance, with a weight bearing capacity of 15 lbs. Snap-Loc MILITARY CARGO NET 96"x144" (4" Squares) Support American jobs and get this "MADE IN USA" product! Our cargo nets are made from heavy duty nylon netting and are strong enough for military use. The 96x144 size and 4 inch wide box web design is perfect for holding down most anything to your pickups, trucks and trailers. 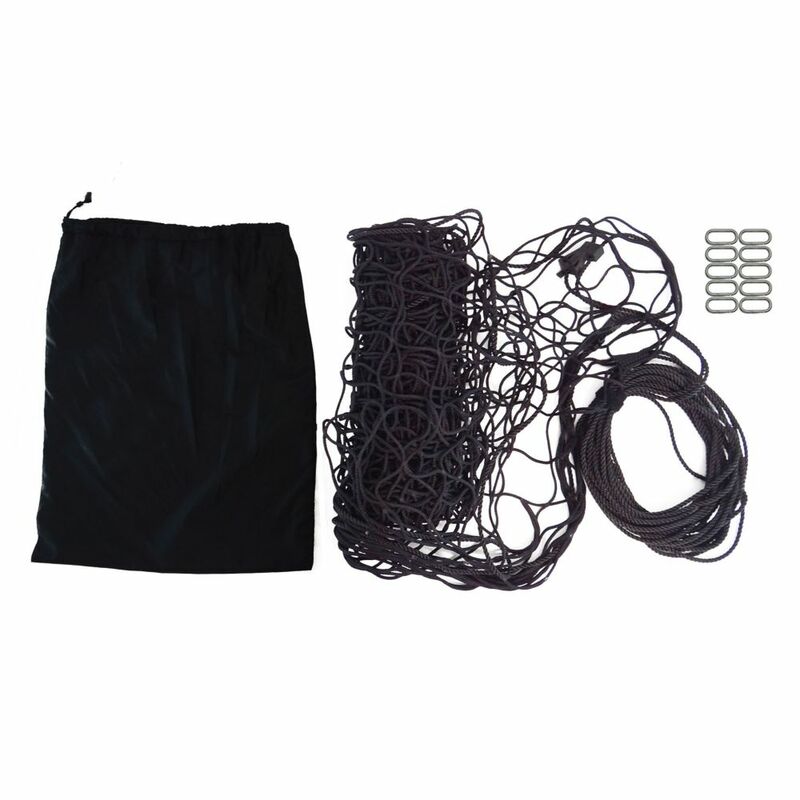 Cinch rope with locking cam allows you to pull the net tight over your cargo items or junk. Includes Spring Clip Carabineers for universal attachment and free Storage bag. Best of all they are Made in USA!